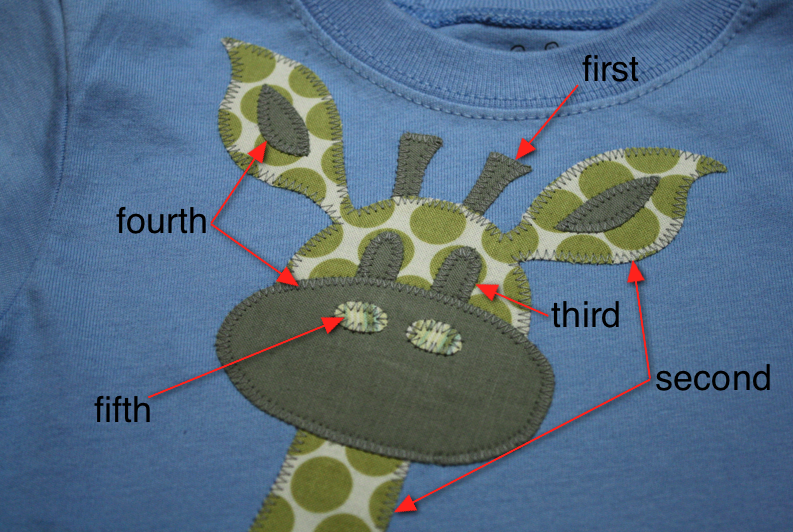 I’ve had several requests for a tutorial on how I do my appliques. 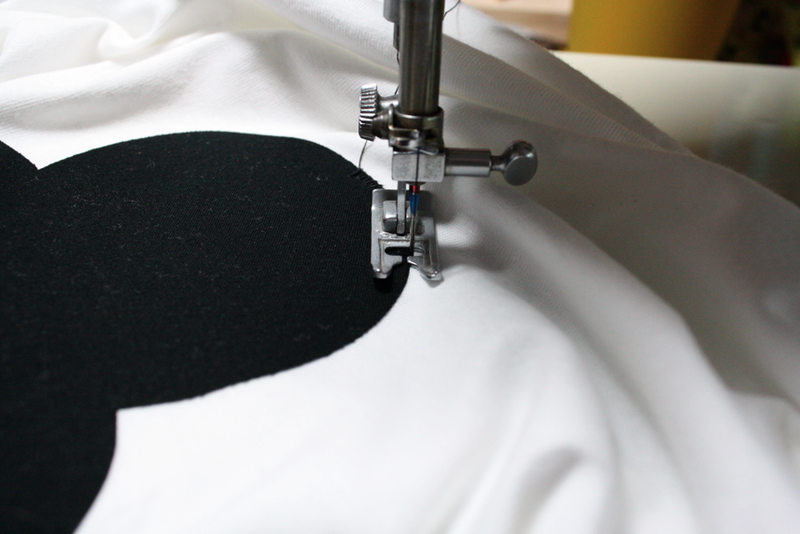 There is no right or wrong way to applique, this is simply how I do it. Also, this is going to be a long post. I don’t like when tutorials are split into several posts as it’s hard to go back to previous steps. This will be all in one place, but quite lengthy! Be warned! 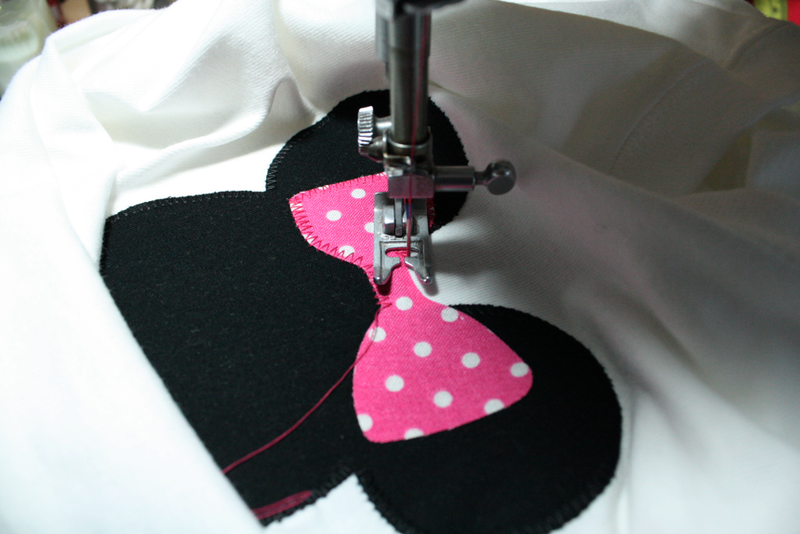 More information on how to applique curves. I want to talk briefly about fusible web. I prefer to use Heat n Bond Lite. There are several brands available on the market (Wonder Under, Stitch Witchery, etc) but I like HnB. There are 2 types of Heat n Bond. The regular Heat n Bond is not meant for machine stitching. You want Heat n Bond Lite. It comes 2 ways–prepackaged or on a bolt. I’ve used both and can tell you from my experience, the stuff off the bolt doesn’t work very well. I prefer to buy a prepackaged roll. It comes in purple packaging. The regular (no sew) is in red. HnB has 2 sides, a paper side, and a slick, shiny side. 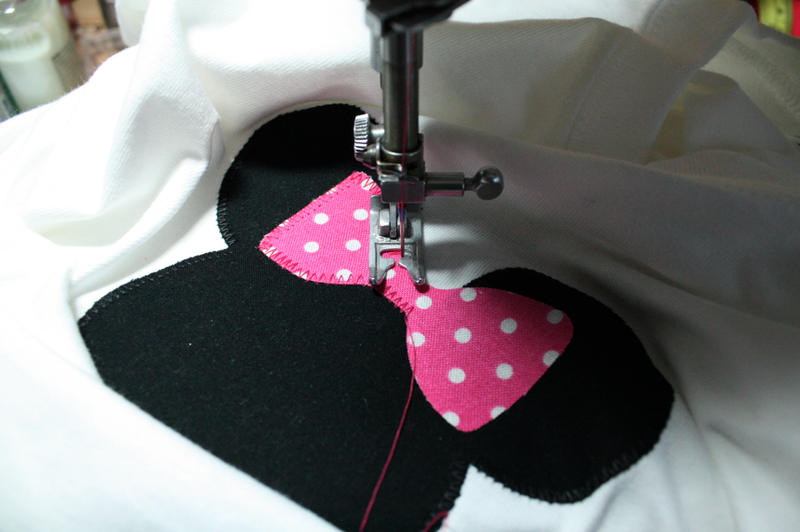 First you need to select something to applique. 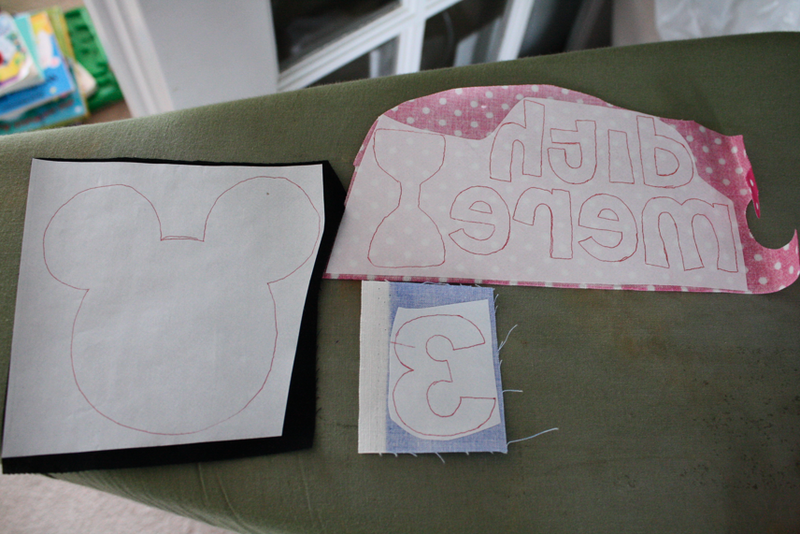 For the example, I’m making a Minnie Mouse birthday shirt for a sweet little soon-to-be 3 year old. 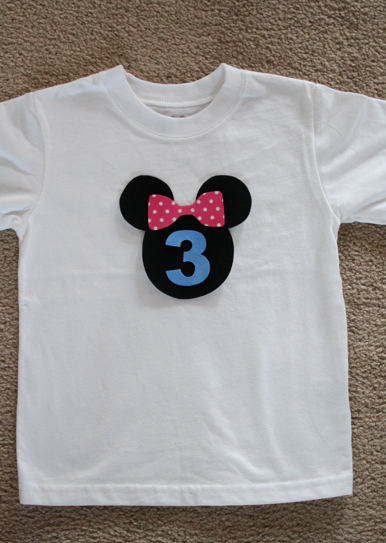 Her Mom asked me for a Minnie head silhouette with a bow and a 3 in the middle to match her party decorations. She also wanted her name on the back. So to begin, I found a good Mickey silhouette on my computer by Googling. 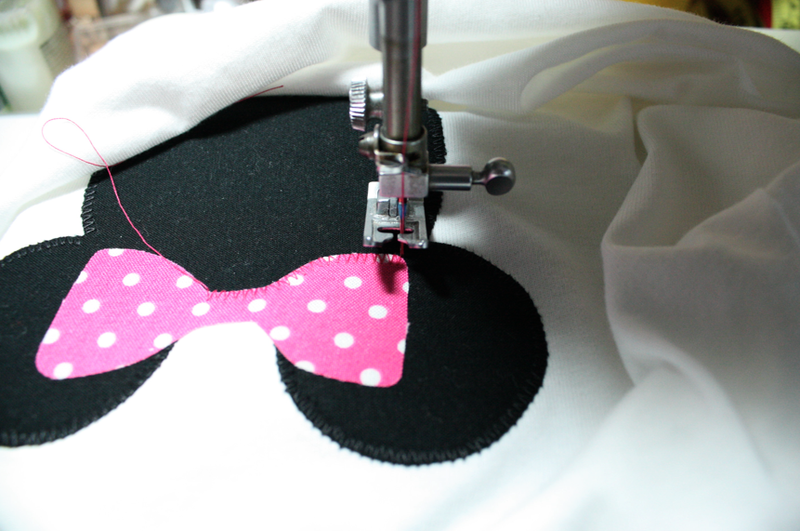 You want to find the cleanest, most basic shape for your applique. The best way to find one is by searching Google images with keywords like template, clip art, outline, etc. So I searched “Mickey outline” and was able to find this one. I trace my images directly from my laptop screen. If you do this, be careful not to press hard! Make sure you’re tracing on the paper side of the HnB, not the shiny side. 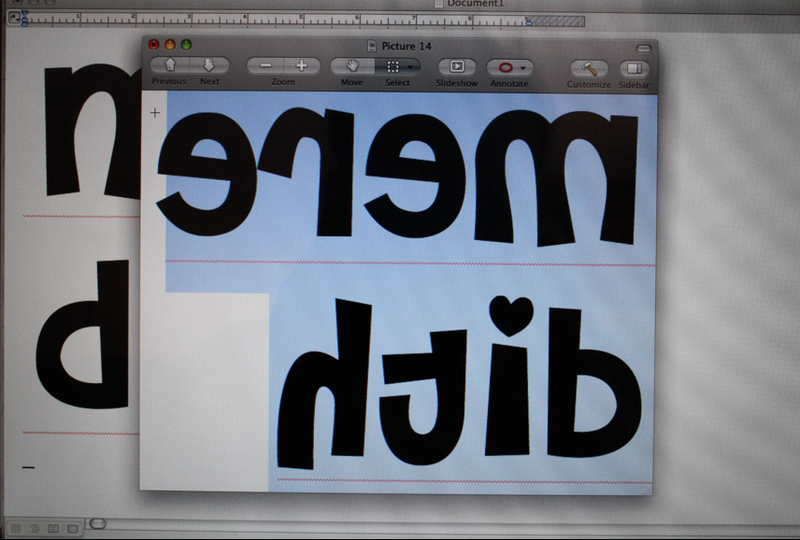 If your image is directional (like words) you’ll need to flip it so it’s backwards on the paper. 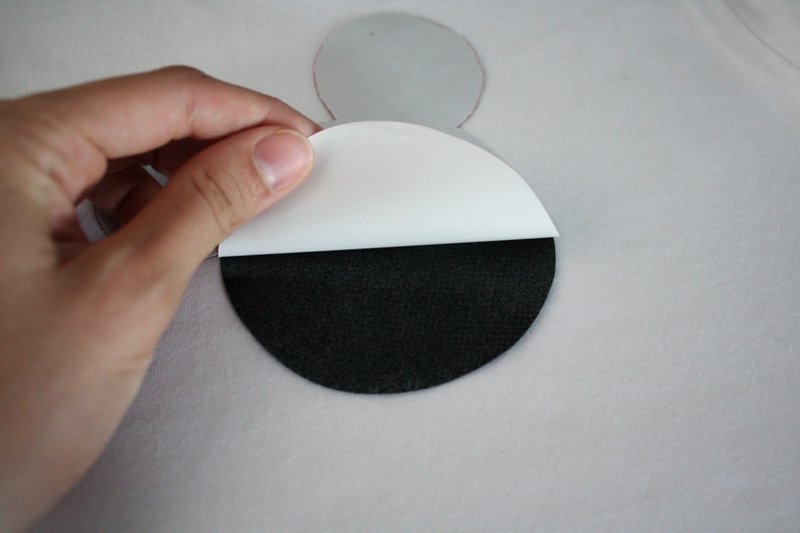 This is because the paper will come off and is the side that adheres the applique design to your project. 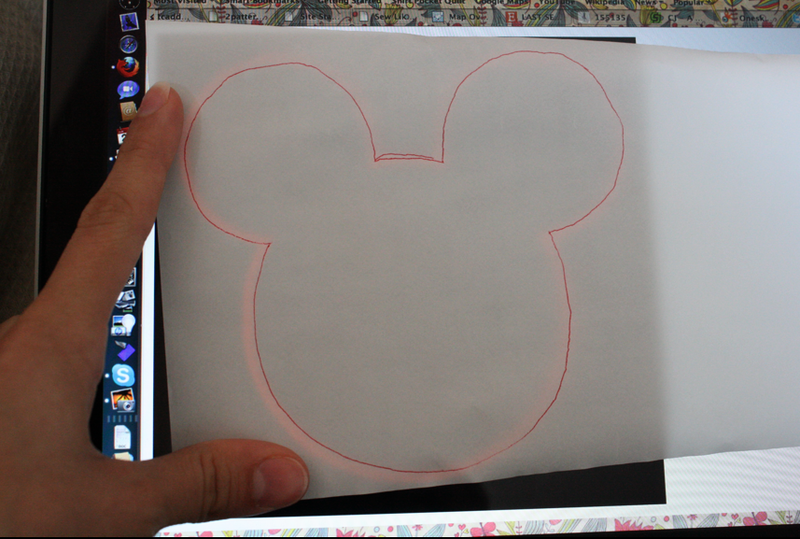 If you cannot reverse images on your computer, simply trace it (or print it at the desired size), turn the paper over, and trace on the fusible web using a light box or other source of light. Trace all your images separately on your fusible web. Once you’re finished it should look something like this. Cut the pieces apart according to your fabric. 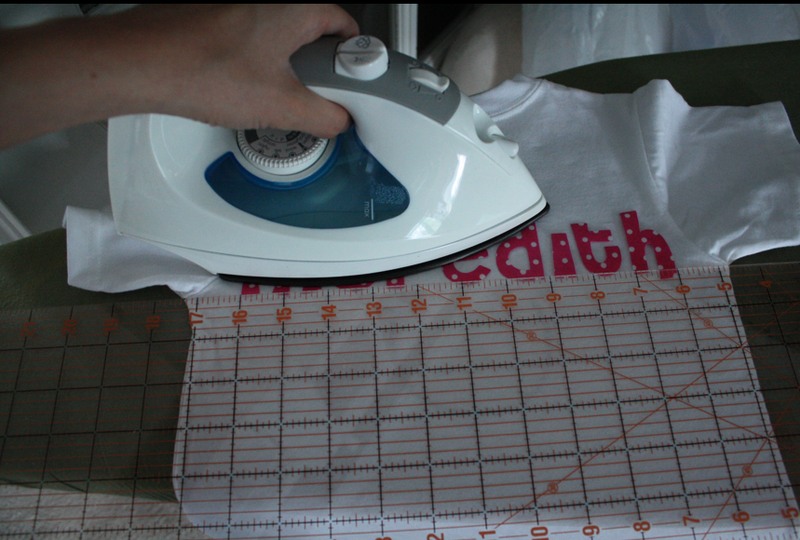 Using no steam, iron them on the WRONG side of the pressed fabric. Cut each part out individually now. I eyeball the placement of the design on the front of the shirt. 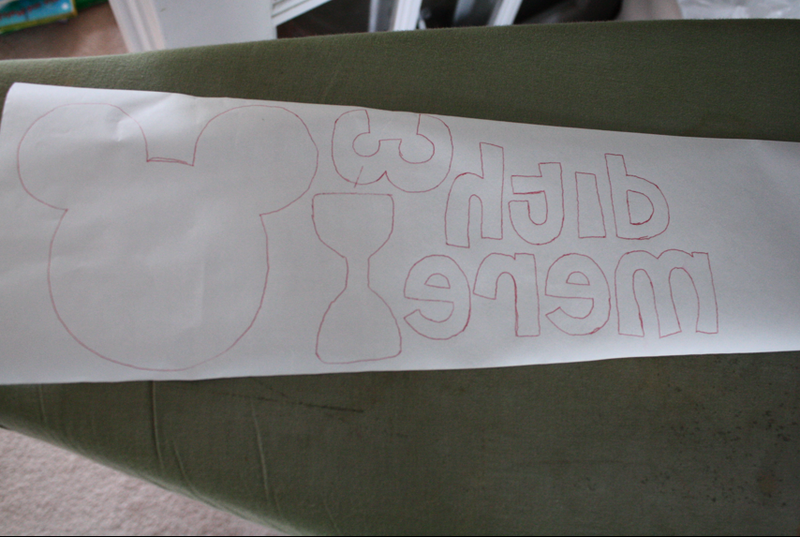 No one is going to come up with a ruler and say, “Oh that’s 1/2 an inch closer to the left seam than the right!” But they might look at it and say, “Hmmm that Mickey looks a little off-center.” That’s my theory, anyway! I like to lay my design together at this stage and make sure all the pieces work. When I’m making something for someone else I snap a picture and send it to them for approval. 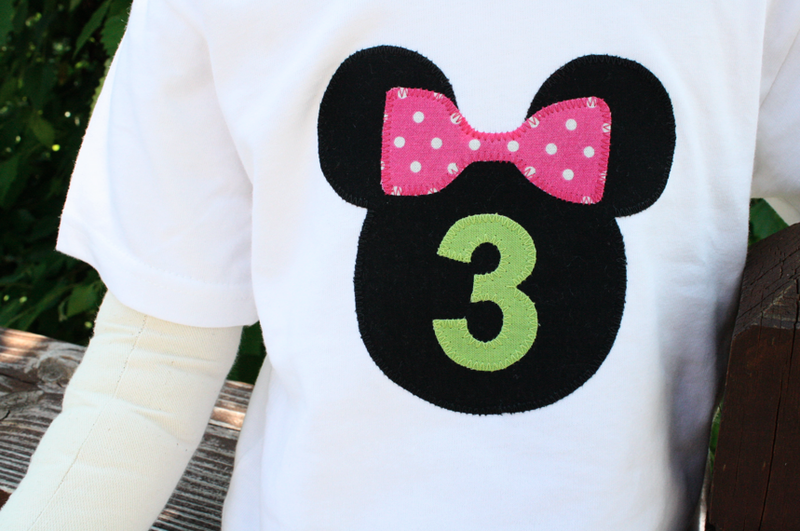 For this shirt, I learned the birthday girl loves green and was able to change the color of the “3” before I started sewing. 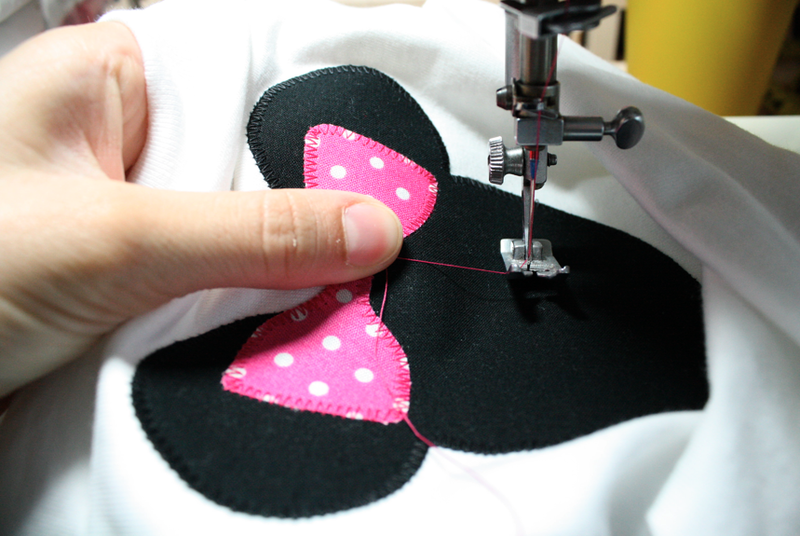 The most important part of appliqueing with many pieces is doing them in the right order. Start with the bottom-most of all the pieces, remove the fusible web paper, and iron it down. There aren’t many pieces in this shirt, so here’s an example of many pieces and the order in which they were sewn. In this case, I started with the silhouette. When sewing on knit, like shirts, I learned through experience that you want to line your stitches up with the outside of the image. The length and width of your stitches is totally a personal preference. 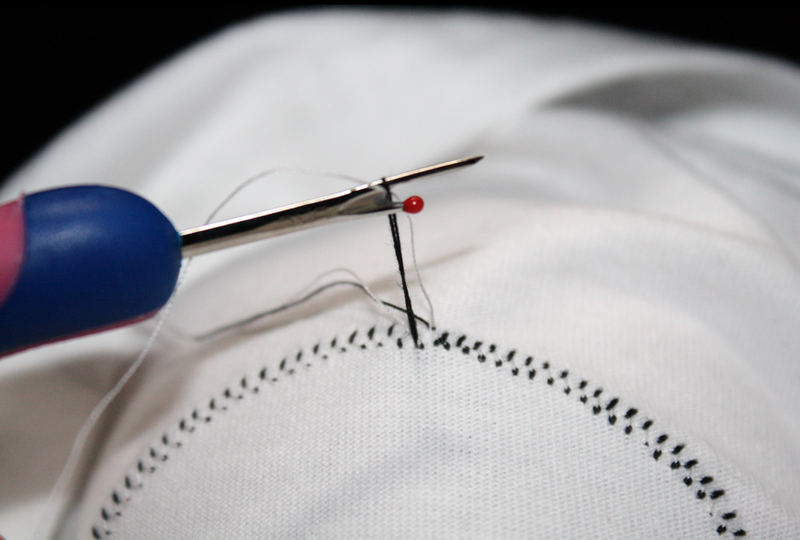 My stitches are about 1/16″ wide and 1/16″ long. Which means there are approximately 16 stitches per inch. Sew around the perimeter of your design, back to where you started. 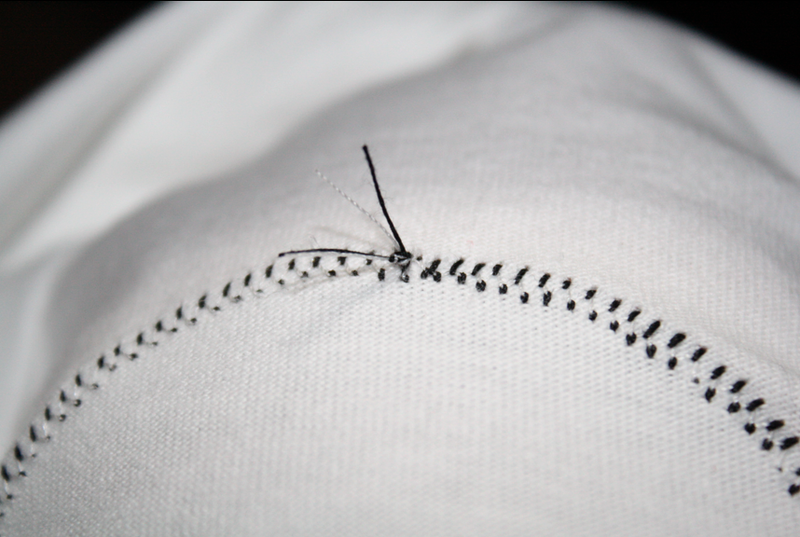 Don’t back stitch when you begin or when you end, just pull your threads and clip. To finish the seam, I pull my threads to the back of the shirt. 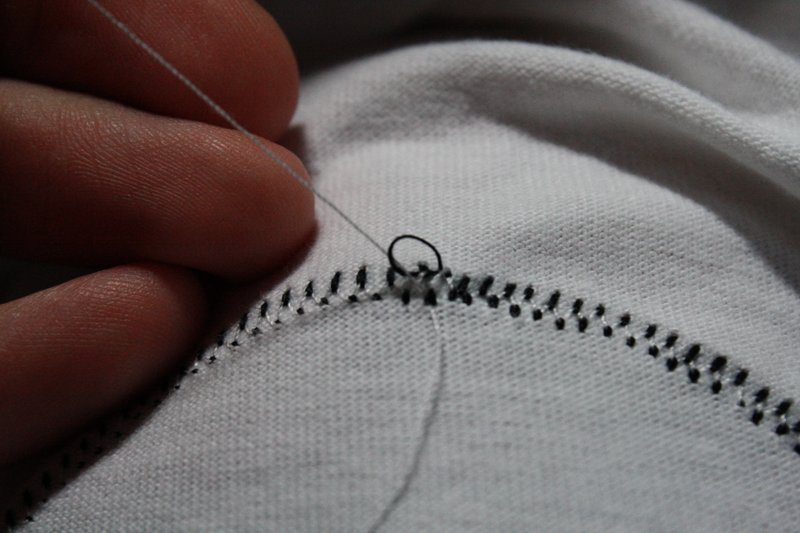 You can do this by threading a needle and pulling them through, or you can follow my unconventional method. Pull on your bobbin thread and your top thread will start to pull through. I use the back side of my seam ripper to catch the thread and pull it through. Pull both top threads through that way, then tie them together several times. 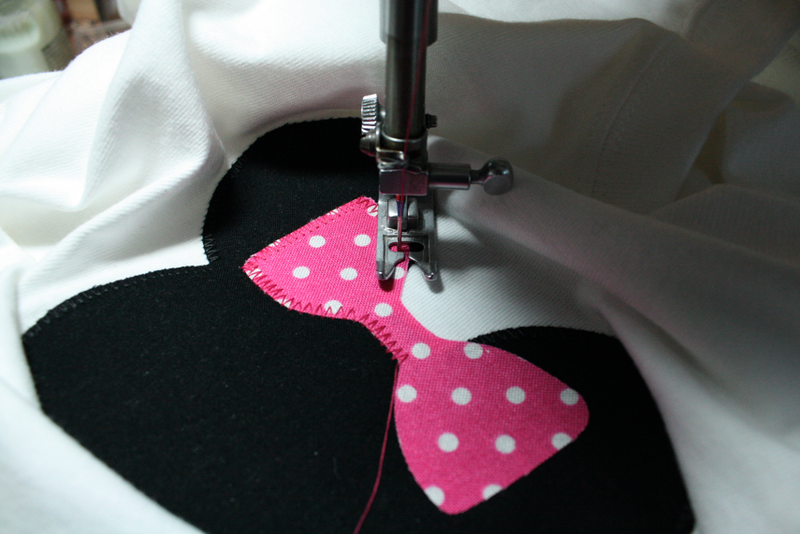 Iron your project between each layer of applique. Move on to the next image you want to stitch. I did the bow next. There are plenty of techniques to stitching and it took me awhile to decide how I wanted to consistently do things. Whenever I come to a corner, I sew to the end, leave my needle in the project, and turn the entire thing 90 degrees. I sew over my last stitch or two, but it keeps it neat and orderly. When sewing curves, I found it’s best to keep the image straight in your presser foot to avoid slanted stitches. 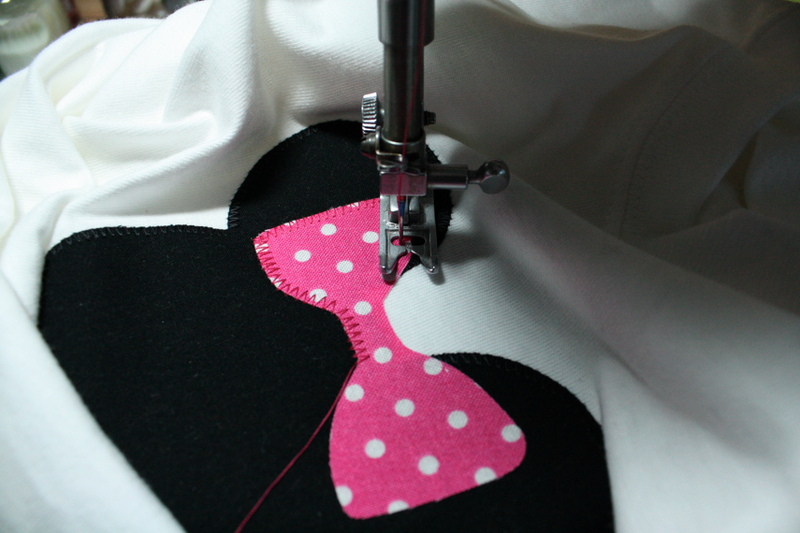 You do this by raising the foot, with the needle in the down position, and making small adjustments as you sew along. Notice how the edge of the bow stays perfectly lined up with the notched edge in my foot? That keeps the stitches straight. Keep lifting and turning as you sew around the curves. Since I don’t back stitch at all, I like to hold my threads as I remove the project from the machine to keep the stitches from pulling. Iron again and repeat with all layers. 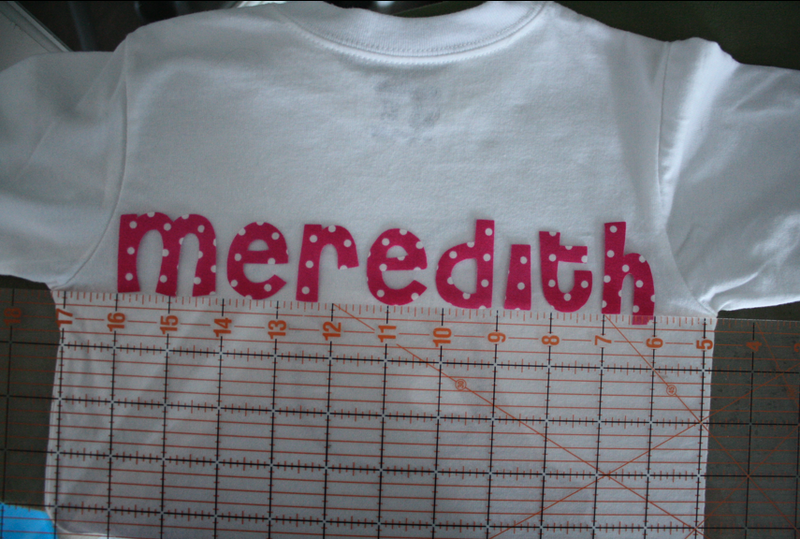 To add a name to the back, I cut out all the pieces, remove the paper all at once, and line them up on a ruler. I do measure these to make sure they’re the same distance from the edge of the shirt, and that the line is straight. I find myself limited by the number of letters I can fit on the back. 8 is usually the max I like to do to keep it looking clean. The shorter the name the larger you can make the font, too. Iron them all on at the same time. But don’t rub the iron back and forth, pick it up and place it each time. Take it from me and my experience! 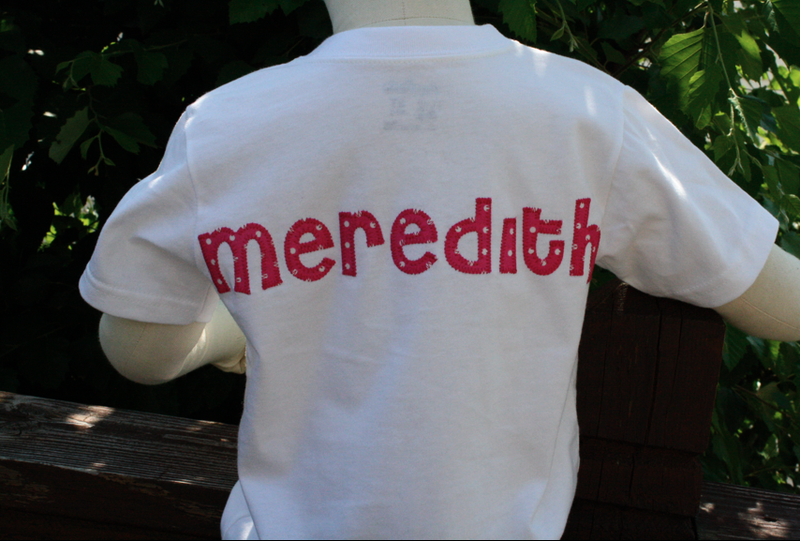 Stitch and finish the letters in the same manner you did the images on the front and voila! You’re done! Hey! I do not have a sewing machine. So I was wondering if u think it would work to hand sew it? Thx!